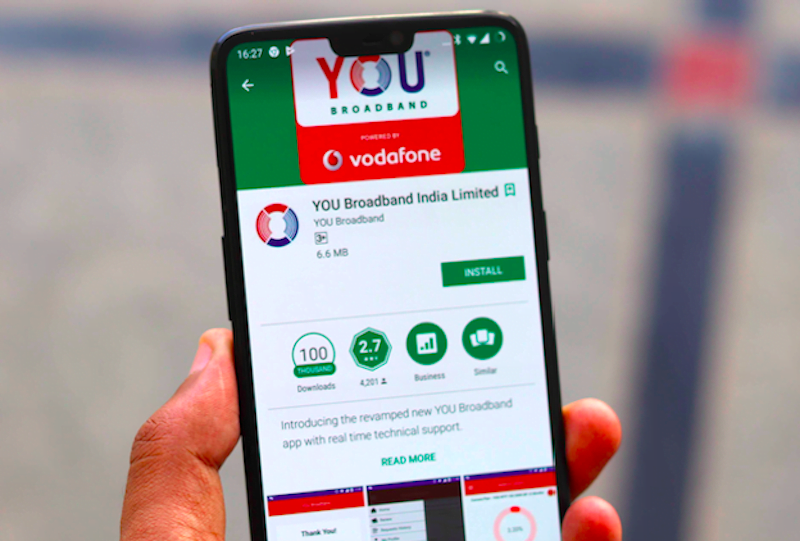 Vodafone-owned YOU Broadband has introduced a new offer under which it’s offering free wired broadband service of up to four months to its existing users. Under this newly introduced offer, YOU Broadband is giving up to four months of free broadband service to users who upgrade from their existing plan to a long-validity plan using the promo code UPGRADE33. This offer will run until September 30, 2018, and a user has to subscribe to a long-validity plan than their existing plan to enjoy free service from the company. In recent times, several broadband companies have come up with such offer and it’s now time for YOU Broadband to do the same. First of all, YOU Broadband’s existing users will be able to avail this offer. Existing users have to choose a long-validity plan which will avail them a total of up to four months of additional service of the same plan. For example, a user is currently on a quarterly plan and if he/she wants to upgrade the plan to six months, then YOU Broadband will be offering additional two months of service, which makes the overall validity of the plan as eight months- six months will be paid and two months of free service from the company. For the users who’re currently on a one-month or quarterly plans and looking to choose six months plan, then the company will be giving a total of two months of free service. On the monthly plan, users will get one month of free service if a user chooses a quarterly plan. All the users on one-month or quarterly or half-yearly broadband plans going for the yearly plan, YOU Broadband will provide them with a total of four months of free service, which means the users will get 16 months of service. Take a look at the below table for the free service validity. The only thing customers need to take care of is to apply the promo code of UPGRADE33. That said, this offer can only be availed via the company’s website (https://youbroadband.in). Existing users have to log in to their account and choose a plan for the desired period, and apply the promo code mentioned above to get the free service. One side, telecom operators are battling against each other, and on the other side, broadband players are preparing for the aggressive launch of Reliance Jio GigaFiber. Rather than going after Jio with affordable broadband plans, the wired Internet Service Providers (ISP) are locking in customers for a longer period, so that they can’t move to Jio GigaFiber. Well, how are they doing that? Here’s the answer: ISPs are bundling attractive offers on long-validity plans to lure more users join their network. Leading players such as ACT Fibernet, BSNL, Hathway Broadband and so on have already come up with such attractive offers, and it’s time for Vodafone-owned YOU Broadband to come up with something similar.